NMM 7410. Natural trumpet in E-flat by Wolf Magnus Ehe I, Imperial City of Nürnberg, 1714-1722. 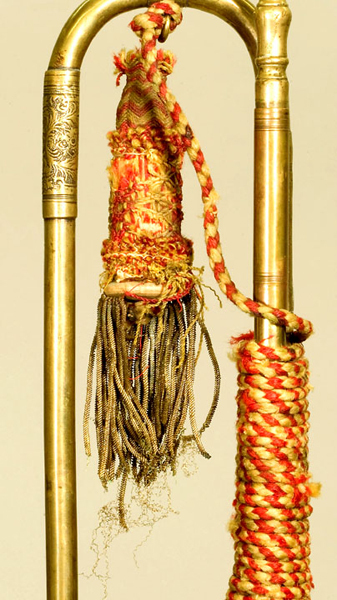 Five-piece brass body with conifer block and red-and-white wool binding; woven tassel with hardwood core and gold-wire fringes. Bell with overlapping tab seam, tabs ca. 5 mm wide and ca. 3 mm apart. Joe R. and Joella F. Utley Collection, 1999. This is one of only two trumpets by Wolf Magnus Ehe I (1690-1722) known to survive; the other one is at the Gemeentemuseum in The Hague. Wolf Magnus Ehe I was the son of Johann Leonhard Ehe II and received his master’s title in 1714, at the young age of 24. However, he did not enjoy his success for very long, dying childless at the age of 32, just two years before his father’s death. 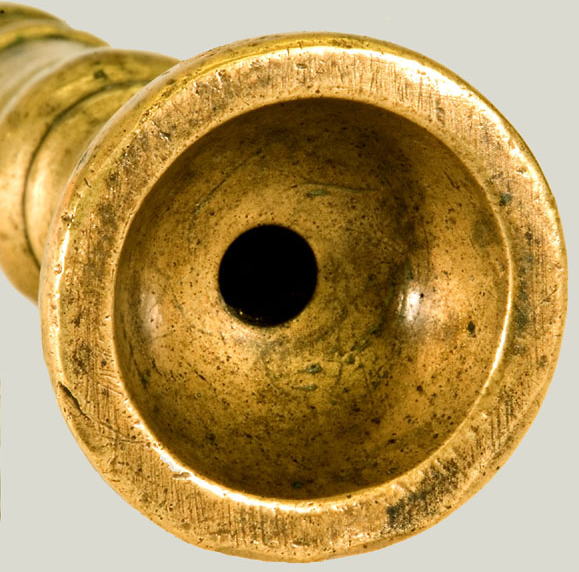 This trumpet shares some similarities (ferrule design and bell-rim wire) with instruments by his namesake and cousin-once-removed, Wolf Magnus Ehe II (1726-1794). 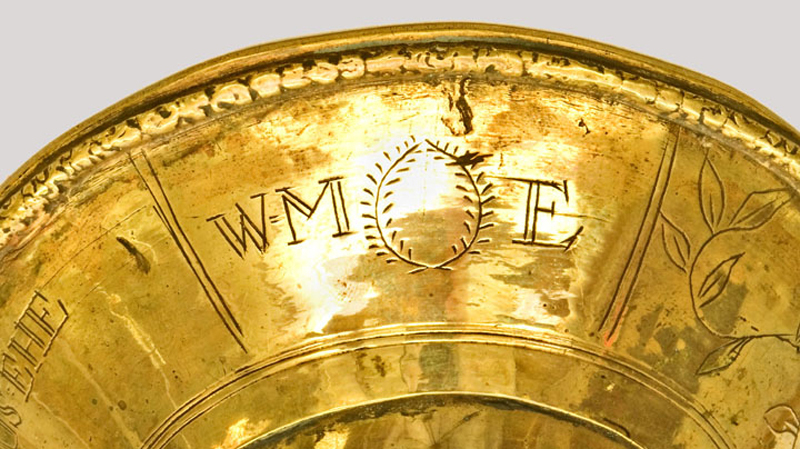 The instruments by Wolf Magnus Ehe I and II can be distinguished by means of their master’s marks, the former featuring a laurel wreath, the latter a turbaned man—a mark which was in use throughout several generations of the Ehe dynasty. 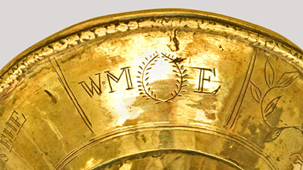 Engraved on garland: MACHT = WOLF = MAGNUS = EHE / IN = NURNB =; master’s mark engraved in the section to the right of the signature: W = M = [laurel wreath] E.
Nürnberg rim, wire impressed with floral and leaf decoration. The tulip engraving on the garland is very similar to the decoration found on the trumpet by Johann Leonhard Ehe III (NMM 7160). The decoration of the straight, upper-garland edge consists merely of three engraved lines. Ferrules of alternating length (long, short, long, short, long) with impressed, lavish, floral-and-tendril patterns on dotted backgrounds, bordered by engraved lines. The plain receiver ferrule on the far left is a replacement. Round, two-part, hammered sheet-brass ball decorated with engraved lines. Sleeves feature same floral design as ferrules. The pattern is not continuous, however, suggesting that two separate sleeves were used on both sides of the ball. Unsigned brass mouthpiece with flat rim and sharp edge between cup and throat; mouthpiece could be contemporary with the trumpet. Tube length: 2019 mm; internal diameter receiver: 11.7 mm; internal diameter minimum (at ca. 60): 10.6 mm; external diameter straight tubing: 11.5-12.1 mm; external diameter bows: ca. 12.3 mm; bell diameter: 108 mm. André P. Larson, "One of the Great Collections . . . Joe & Joella Utley Donate More than 500 Rare Brass Instruments," America's Shrine to Music Museum Newsletter 26, No. 4 (November 1999), p. 2.